NOTE: I am no longer actively pursuing work as a DoP. I’ve left this page up as a reference, for those that are interested in my background prior to and in the early days of CinemaTechnic. A native of Miami, Florida, Jorge Diaz-Amador began making films at the age of 14, shooting science fiction themed Super-8 movies with his friends. This set off a lifelong study of filmmaking and art that continues to this day. He graduated from the University of Miami in with a B. S. in Communications, specializing in Motion Pictures, with a second major in Fine Art. While at U of M, Jorge was considered one of the best cinematographers in his class and was always in demand to be DoP of student projects. I consider fortunate to be a part of one of the last generations of film students who shoot on film and actually projected film prints, rather than the video-centric workflow that is prevalent today. After leaving U of M, he began work as a motion picture camera technician and camera assistant. Later turning free-lance as a First Camera Assitant, he had the opportunity to learn from many experienced Directors of Photography. 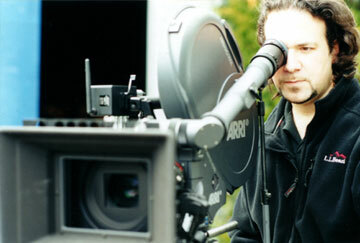 In 1994 he founded Diaz-Amador Productions, Inc., and began working as a Director of Photography. He worked on many varied projects, including several independent feature films. In 1996 he served as Director of Photography on two features, Never Look Back (a.k.a Always Something Better) and Suicide Blonde. He also shot second-unit footage for the horror feature Dweller in the Dark. Subsequently he has concentrated on national and international television commercials, promo spots and music videos. Jorge was awarded three Promax International Gold Awards for his work as Director of Photography on promotional spots for the USA Network. A fluent Spanish speaker, he has also done much work for the Latin market such as music videos for such international artists such as, Shakira, Celia Cruz, Ley Alejandro, Sergio Vargas, Brenda K. Starr and Strings. His last feature as Director of Photograpy on Southern Justice, was released domestically by Velocity/THINKFilm. Southern Justice is available on DVD from Velocity Entertainment and was aired on Showtime Extreme and TMC Xtra cable channels in 2006. Jorge also lensed the short films The Girl Next Door, About Matthew, Bummy Stone, Jamaica Motel and Dixon’s Girl. 2000 Jorge launched a new division of Diaz-Amador Productions, Inc. named CinemaTechnic, which took over the technical side of the business. He began to service his own camera equipment as well as all models of ARRI motion picture cameras and cine lenses. After the flirtation with new technology medias has run its course, many artists tend to come back to media that have a tactile feeling. Media that seem give feedback to the artist and have a special quality that is often referred to as having a soul. Just as oil paint is still with us hundreds of years later, motion picture film will be around a lot longer than conventional wisdom would have it. Also an expert motion picture lens technician, Jorge has participated in the very selective ARRI, Canon, Cooke Optics and Carl Zeiss factory training programs. He is also a skilled precision machinist (self-taught) and has designed and made many of his own specialized tools. Jorge moved to the Los Angeles area in 2010 and currently lives in North Hollywood, CA. ©2001-2016 CinemaTechnic, Inc. all rights reserved. Please contact us via e-mail if you wish to reproduce and part of this text. 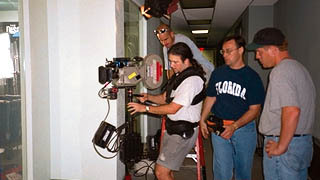 Another music video at Jimbo’s, Key Biscayne, FL Jorge operating Steadicam for Vincent Hogan (in Florida shirt), now president of Cineworks Digital Studios film lab.